The sky is falling. Mercy is more Gordon Gekko than Henny Penny, she’s a futures trader at the top of her game, but she can sense it. Something unknowable is about to wipe the slate clean. Kieran Hurley, of Beats fame, has produced a surging, ink-black torrent of a show, railed out from behind a desk at the rhythm of calamity. Disparate characters – the trader, a young girl in the grip of cyberbullying, a frustrated barista on his final warning – are beginning to vibrate in harmony with a terrible, final frequency that hums like the end of everything. 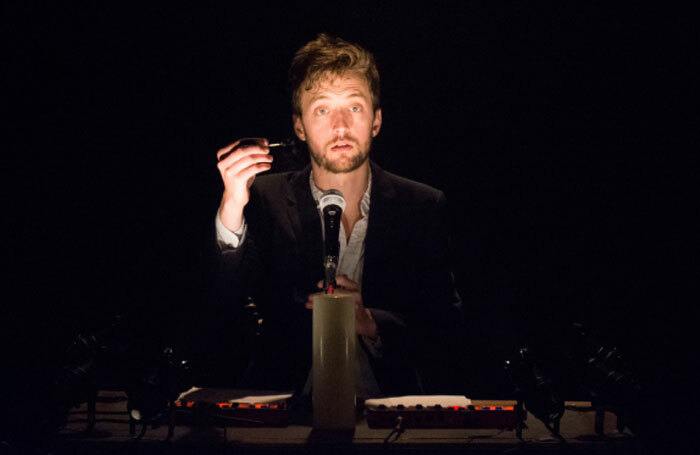 It’s a brilliantly written and performed monologue by Hurley, accompanied by a gorgeous live-sequenced score composed by Michael John McCarthy, but it’s fatally undermined by its irrefutable similarity to two of 2014’s best shows: Christopher Brett Bailey’s This Is How We Die and Chris Goode’s Men in the Cities. The likenesses extend far beyond some formal mirroring (Brett Bailey didn’t invent the newsreader format, after all) into narrative structure, themes, content and even jokes. At its best, as in the links drawn between capitalism and catastrophe, Heads Up is a work that transcends its influences. Elsewhere it is all but swallowed by them.